Employers are battling economic uncertainty but still struggle to source much-needed skills. In such a volatile jobs market, what role does recruitment process outsourcing have in workforce planning and hiring strategies? Jo Faragher investigates. Traditionally, the drivers for outsourcing have been around cost savings and support with volume recruitment. But while saving money remains important, there’s a lot more focus now on candidate quality and experience, according to industry analysts Everest Group. “For those who have not adopted RPO before cost is an important driver. Apart from that, it’s about scalability and adaptability. It means they can add to employee base or reduce more flexibly,” explains Vishal Gupta, practice director of Everest’s business process services division. The global Recruitment Process Outsourcing (RPO) market continued to remain one of the fastest growing single-process Human Resources Outsourcing (HRO) markets in 2016, growing at a rate of 16 percent to reach a cumulative market size of US$2.85 billion, according to Everest Group. In 2016, RPO saw wider acceptance among companies of all sizes, including small (less than 3,000 FTEs) and mid-sized (3,000-15,000 FTEs) buyers, which captured an increased share of the market at 51 and 6 percent, respectively, as compared to large buyers at 43 percent. Digital adoption is the trend most strongly attributing to this rapid growth. RPO service providers are increasingly differentiating themselves through technology, increasing their investments in both technology partnerships and proprietary solutions. The exact nature of the “partner+build” strategy adopted by each provider is dictated by the regional availability and quality of off-the-shelf talent acquisition tools. Annual technology investments vary considerably among providers, ranging from $1 million to in excess of $100 million. Efficiency focused technology solutions such as Applicant Tracking Systems (ATSs), Customer Relationship Management (CRM) tools, and Robotic Process Automation (RPA) systems are readily available through technology partners and have essentially become “table stakes” in the industry. In fact, nearly half of all RPO engagements include provision of ATS solutions. So, now, the focus for differentiation has shifted to technology solutions that either enhance the experience of candidates or generate better insights on various aspects of the recruitment value chain. 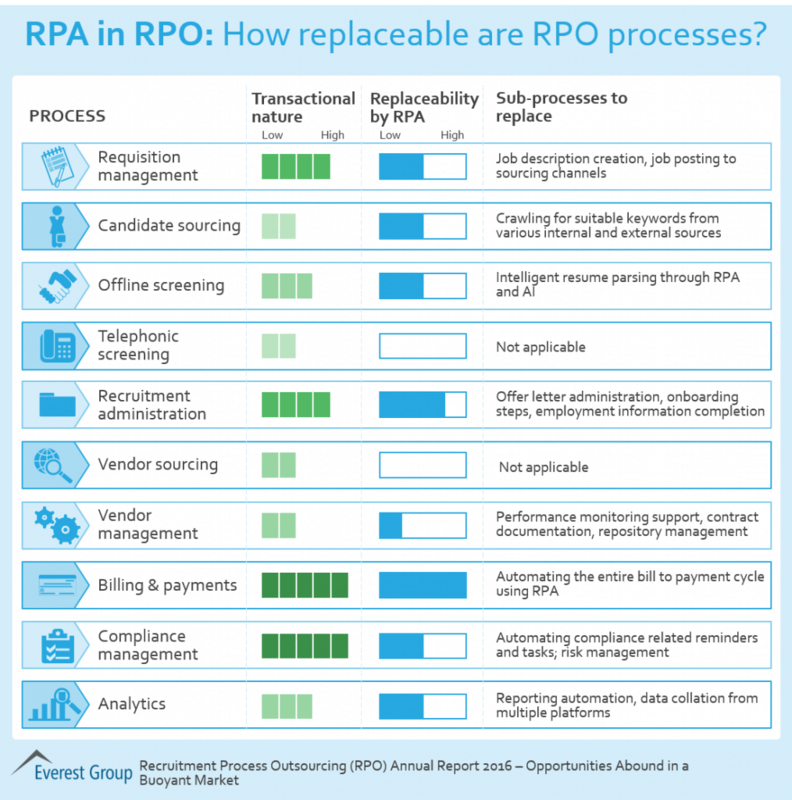 Accordingly, RPO service providers are adjusting their “partner+build” strategies to rapidly assimilate into their service portfolios additional technology solutions such as self-service scheduling tools and chatbots (primarily acquired through partnerships) and advanced analytics (primarily developed through proprietary investments). These and other research findings are explored in a recently published Everest Group report: Recruitment Process Outsourcing (RPO) Annual Report 2017 – Strategic Value Creation in a Rapidly Evolving Market. This research provides comprehensive coverage of the RPO market and analyzes it across various dimensions such as market overview, key business drivers, buyer adoption trends, solution and transaction trends, and service provider landscape. The mature market of North America saw a decline in its market share, with the emerging markets of Eastern Europe and Latin America gaining at its expense. The biggest growth of single-country RPO was seen in deals outside the mature markets of the United States, United Kingdom and Australia. Many countries in different regions across the world are emerging as strong RPO markets on their own, particularly in Latin America, Continental Europe and Asia Pacific. RPO as a concept continues to gain wider global acceptability as evidenced by the rising number of multi-country deals. These are more complex deals, which require both the buyer and service provider to invest more time and effort in order to understand local nuances. Value-added processes such as employer branding, talent communities, workforce planning and assessment are increasingly becoming table stakes; buyers are now demanding next-gen value-added services such as consulting (especially for technology strategy and implementation), talent engagement, and content creation and communication. 2016 saw heightened activity in the market around Total Talent Acquisition (TTA) services, as demonstrated by a 41 percent increase from 2013 to 2016 in number of new TTA deals.